Quickstep's RST process can produce carbon composite parts with a high quality surface finish. 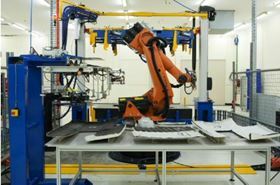 This ‘robotised’ process automates production of carbon fibre composite car panels so they can be made in minutes and at very low cost compared to other, more capital-intensive methods. RST enables car parts to be mass-produced with a high quality finish direct off the mould, Quickstep reports. See: Quickstep awarded grant to develop RST technology. "We are delighted to have demonstrated RST’s technical success by repeatedly manufacturing carbon fibre composite panels with our pioneering automatic plant in Sydney," says Quickstep managing director Philippe Odouard. "It delivers car parts with a Class-A surface finish – without the need for the ‘re-work’ that is commonly required with the manufacture of carbon fibre automotive panels." We have delivered carbon fibre test panels to several carmakers to demonstrate the RST technology’s value. The price competitiveness of RST compared to other technologies is attracting attention, and has led to requests for quotes. Quickstep plans to manufacture exterior parts itself and to also licence the technology. It expects to start manufacture of parts in small quantities within the next few months and to increase to larger quantities shortly after. Quickstep says it is in discussions with several leading global automotive manufacturers with a view to manufacturing panels using RST technology under licence. The company is pursuing large-volume production tests in co-operation with industrial partners in Germany, including Audi. Research and development of Quickstep’s RST technology was partly funded by a $2.5 million Climate Ready Grant from the Australian Federal Government. Quickstep Holdings (ASX:QHL), a manufacturer of advanced carbon fibre composites for the aerospace and defence and automotive industries, operates out of facilities at Bankstown Airport in Sydney, Australia. The company is an approved supplier for the international F-35 Lightning II Joint Strike Fighter (JSF) programme.